When I was living in a studio complex some years ago, one of my colleagues showed me some features within FL 4. I was immediately fascinated by the workflow and how fast a whole song idea could be created. The fact to compose songs and quickly notate ideas on the road within FL Studio was a real innovation for me. Since then I got stuck with FL Studio and never stopped using it. How did you use FL Studio in your productions? I used FL Studio a lot to create pattern for projects or to get a hold on to some ideas for studio sessions. In some cases I created whole tracks for productions with FL Studio. One of those productions was a remix for an English label on a train trip to a gig from Hamburg to Mannheim. … I think that is a hoax. Only people can say this, who hasn’t even tried FL Studio. Nowadays user get irritated if software offers everything you need and doesn't cost much. You can produce everything with FLS from an idea to a master. A lot of named colleagues will agree on this. Especially the signature bundle offers a huge range of instruments and effects which fit every need. I think the combination between software and controller or keyboards will still play a relevant role in the future of studio productions. External sound expander and outboard equipment could be used less due to the growing 64bit platforms and improving virtual instrument market. Yes, I’m producing my new single which will be released at Kontor and I also work with Gordon (one part of “The Disco Boys”) in the studio on the new single for our project Master & Servant. 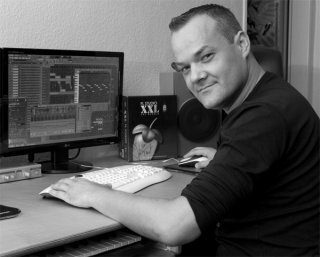 Then I work together with a talented DJane who recently bought FL Studio. She was thrilled about the software and asked me to finish her ideas together in FL Studio. There would be armed disk recording: I can quickly create a remix package and export the relevant tracks without any annoying delay . I also love the step sequencer with the swing knob and the precomputed effects offer me quick fades from left to right (swap stereo), awesome. I also think that the users will love the Riff Machine in the new version 9. It’s so simple to generate chords and melodies with just one click - also helpful to get an inspiration for a song. The tools help to realize things quickly which would cost me time somewhere else. All in all the software saves CPU resources and it doesn't generate annoying graphic ballast. I perform almost every Wednesday from 23h on in the „H1“in Hamburg. It’s a real cool club and its worth to party at. And I do a radio show at JayJay.fm and 54House.fm that is called club mission. All bookings and information about me can be found @ www.jay-frog.com. How did you get to know Deckadance and what are the advantages to you? Right, I was searching for a tool that works just well on little computers (netbooks). Deckadance is very practical to me because it can learn almost every vinyl time code.